Lovejoy's published torque ratings are maximum nominal values, and care must be taken to insure that proper service factors are applied for the application to come up with a design torque. This calculated design torque must still be less than the published nominal torque rating. Service factors allow for adequate coupling life given that different types of equipment, even if the torque requirements are the same, will put different stresses and wear on a coupling. Lovejoy's catalogs also give charts with the specific UPC # (Universal Product Code) for each component of a complete coupling. 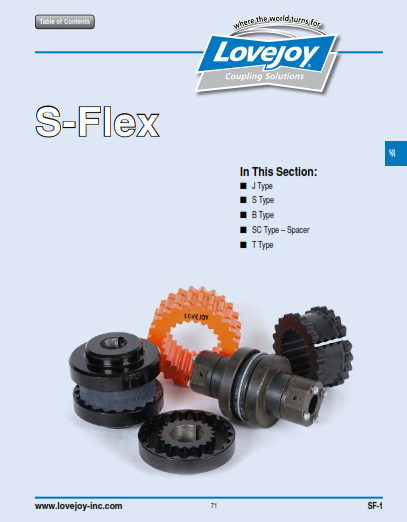 For help with quickly determining design torque and selecting the proper S-Flex coupling size, consider downloading the Lovejoy iPhone & Android selection app or use a similar tool on your desktop.